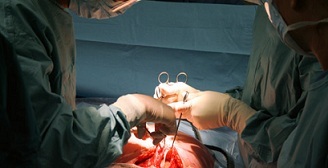 Many orthopedic physicians do not recommend back surgery until they absolutely have to. They tend to treat a surgical operation as a last resort. Often individuals who have to undergo these surgeries are victims of serious automobile or workplace accidents. If you have incurred a permanent spine injury as a result of a car collision, or have filed a workers’ compensation claim relating to a back injury, contact the North Carolina accident attorneys of Maginnis Law. Our lawyers have experience representing clients with serious back and neck injuries and will aggressively represent your interests against the insurance company. To discuss your claim, call the Raleigh injury attorneys of Maginnis Law at 919.480.8526. One of the more common injuries caused by automobile and workplace accidents is the herniated disc. The human spine has twenty-six (26) hard vertebrae along the spine and between each is a soft disc that acts as a cushion. Inside of each disc is a material known as nucleus pulposus. A traumatic injury can cause that material to escape into the vertebral foramen, the area of your spine enclosing the spinal cord. Once there, the nucleus pulposus can apply pressure to the spinal cord and cause debilitating, radiating pain down the extremities. There are two primary surgeries used to treat a herniated disc: a discectomy and a fusion. The discectomy is usually the first option. The goal of the surgery is simply to go in and remove the nucleus pulposus impinging upon the spinal cord. This can, in many cases, lead to immediate relief following the surgery. A discectomy is most commonly performed at level L4-L5. It may also be performed on the cervical spine, including at C6-C7. In some cases, a discectomy may not be enough. This may occur, for example, if there is little of your disc left. In these circumstances, your orthopedic surgeon may recommend a disc fusion. This surgery involves placing a piece of bone where your disc formerly was. Over the course of several weeks that piece of bone will fuse together with the two vertebrae it is situated between. The attorneys of Maginnis Law provide free consultations to all prospective back injury clients from our offices in downtown Raleigh, including those undergoing discectomy and fusion surgeries. We offer contingency fee arrangements, meaning you only pay attorneys’ fees if we make a financially recovery on your behalf. And, because we do not use large staffs of “case managers” and “claim administrators,” you can be sure that you will have direct access to your attorneys. Our firm believes a strong relationship between client and lawyer leads to the best result.